This manual window regulator is a complete, ready to bolt on, direct replacement part. It's just what you need to get your vehicle in good form again! Replace your rusting or broken window regulator now with this great fitting alternative. It makes a great replacement and has substantial cost savings over a dealer unit. We are committed to offering the absolute best value for our customers. If you want a highest quality window regulator at a great price, please see our other "High Quality" window regulator listings. If price is your main concern, we are offering this economy style window regulator as well. It is the same one that most internet sellers are offering. 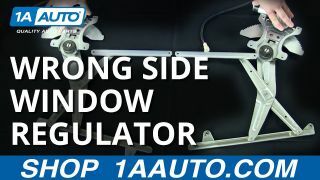 While this window regulator is a good replacement, it is not backed by the same warranty as our high quality regulator.